The Rise of the Empress duology was a thoroughly unexpected series, and, even more unexpected, was that reading these two books reminded me of two important things. First, sometimes your expectations are completely wrong and that you should check them at the door. Second, that it’s not always a bad idea to give a series a second chance. The Rise of the Empress duology written by Julie Dao consists of two books: the first is Forest of a Thousand Lanterns and the second, which takes place years later but centers on a different character (and thus can be read as a standalone if the reader wishes), is called Kingdom of the Blazing Phoenix. As a whole, the Rise of the Empress duology is an East-Asian reimagining of Snow White, set in a fantasy world inspired by the Far East. Forest of a Thousand Lanterns follows eighteen-year old Xifeng, a peasant girl in a forgotten village, whose witch-aunt foretells a future of darkness, magic, royalty, and immense power. With her beauty, wit, and ambition, Xifeng leaves her village and sets on a path to claim her foretold place on the throne, under the tutelage of an evil god who thirsts for power – but with great cost. And thus, I read Forest of a Thousand Lanterns in October 2017 after I heard overwhelmingly positive reviews that praised the antiheroine and villain origin story narrative, Xifeng’s wicked and compelling characterisation, and atmospheric scenery and worldbuilding. Unfortunately, I found Forest of a Thousand Lanterns incredibly underwhelming. Although I was excited for the worldbuilding in Forest of a Thousand Lanterns, particularly for its East-Asian influences, I found that the worldbuilding lacked the richness and consistency. I do not believe that worldbuilding should embody an essentalist notion of ‘Chineseness’ or ‘Asianness’ – because, after all, what does that even mean? – but the East-Asian influences were confusing and awkward, perhaps due to the way that the exposition was conveyed and delivered. The worldbuilding, however, was not at all a problem compared to Xifeng’s characterisation. For all the praise for Xifeng, a woman who was wicked, ambitious, and clever, I did not find Xifeng to be compelling nor complex. I struggled to feel invested in her character arc; perhaps it was the writing style, which I found to be lacking an active tense which consequently undermined the importance of significant scenes, or perhaps Xifeng’s characterisation and development was predictable and inconsistent. Indeed, there were times where her values confused me and the ‘inner conflict’ that she felt lacked depth. There were many characters in the book that had the potential to be interesting and compelling. The romance between Xifeng and Wei, whom the former claimed to be deeply in love with the latter, lacked chemistry; in particular, I found that the strong feelings and possessiveness that she claimed to feel were forced. Furthermore, I was particularly interested in the characters that clashed with Xifeng’s worldview and ambitions, and how this would challenge her as a character. To my disappointment however, the characters I found to be interesting were relegated to the sidelines whilst the characters that I found to be bland and predictable were developed in their stead. All in all, Forest of a Thousand Lanterns was a mediocre and lacklustre story; one I found disappointing for all my high hopes for a sweeping Asian-inspired fantasy about an antiheroine’s rise to power. 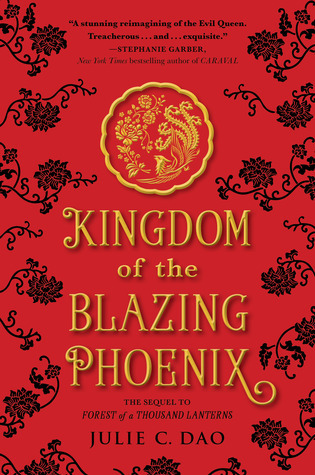 I didn’t feel invested in Xifeng’s story, and thus felt little motivation to read its sequel, Kingdom of the Blazing Phoenix. And then I heard that Kingdom of the Blazing Phoenix was possible to read as a standalone as it centered on another character, in another time, and in another world. And so, I gave this series another chance – and I’m glad that I did, in the end. Premise in a sentence: An antiheroine strikes a deal with a dark god and rises to power to become the Empress. Perfect for: Readers who enjoy antiheroine narratives; who enjoy dark retellings. Think twice if: You’re looking for rich worldbuilding; like an active voice in storytelling. Kingdom of the Blazing Phoenix is set many years after the events of Forest of a Thousand Lanterns. The protagonist of the first book, Xifeng, has now been Empress for over a decade, and her empire and its people have suffered in the hands of her selfish and ruthless regime. Enter Jade, stepdaughter of Xifeng, who has hidden away in a monastery in exile and has lived a humble life. When Xifeng summons Jade to the palace to take her place in the royal court, Jade suspects that Xifeng has more planned for Jade beyond making amends to a stepdaughter she never knew. And thus Jade embarks on a quest to summon the Dragon Lords to dethrone and defeat Xifeng and her god for good. I have to admit: I went in with Kingdom of the Blazing Phoenix with tempered expectations. However, I was intrigued by the fact that Jade was completely unlike Xifeng – to many people’s chagrin – and that this story was a quest story. I actually really do love quest stories: though sometimes formulaic, I love quest stories and how they intertwine with self-discovery character arcs, that new lands are explored (which thus offer an opportunity for the writer to really show us the depth and creativity of their world), meeting different people who contrast with the main characters in values, thought, and motivations, and how quests are always about resilience, friendship, and inner strength. To my surprise, I actually found myself really enjoyed Kingdom of the Blazing Phoenix. For one, Dao’s writing significantly improved since Forest of a Thousand Lanterns, and I found myself readily engaging with the material with every chapter. Additionally, Jade was a brilliant character. Indeed, she may be no antiheroine nor does she have a drop of wickedness in her heart, but I found her earnest approach to justice, goodness, and friendship incredibly refreshing, particularly when juxtaposed with the grim era of Xifeng’s regime. More importantly, whereas I did not really care for Xifeng and her success, I wanted Jade to win and I rooted for her at every step. Additionally, the relationships in Kingdom of the Blazing Phoenix were wonderful. In contrast to Forest of a Thousand Lanterns, which felt like the relationships were shoe-horned and lacked depth, the friendships and love in this story were genuine and heartfelt. There was friends-to-lovers (and I loved how Jade and her love interest come together in mutual love for storytelling and respect), found-family between two motherless women, and the poignant and bittersweet maternal love that transcended time and space. Above all, the ending was incredibly satisfying; epic, emotional, and left me feeling content with the overall series. Although I didn’t particularly enjoy Forest of a Thousand Lanterns, I would recommend the book on the basis of, either, that you might like it and enjoy the antiheroine/villain origin story or you are interested to read Kingdom of the Blazing Phoenix. Although you certainly don’t have the prequel to enjoy Kingdom of the Blazing Phoenix, I recommend it nonetheless; you will find subtle nods to elements of Forest of a Thousand Lanterns, and some really emotional moments in this book will have more meaning and significance if you have read the prequel. Premise in a sentence: A princess in exile returns to her kingdom and goes on a quest to summon a powerful force that can bring down the corrupt Empress. Perfect for: Readers who like adventure stories; readers who enjoyed Forest of a Thousand Lanterns and want to meet the antithesis of Xifeng; readers who enjoy found-family relationships. Think twice if: You’re not a fan of reading about ‘the good hero(ine)’; don’t enjoy quest/adventure narratives. I have to say, this series humbled me. Even though I would consider myself an experienced book blogger, I fell into the trap of judging a book by it’s hype. I also might have missed out on a great sequel if I had not given the series another chance! This makes me think about all the series I could become invested in if I gave their sequels another go. Or, should a first book be indicative of the rest of the series? What do you think? Do you think we should give a sequel a chance, even if we didn’t like the first book much? Have you read either Forest of a Thousand Lanterns or The Kingdom of the Blazing Phoenix? What did you think? Thank you for doing this post. It’s a great way to look at it. I had similar problems with Forest. My biggest one was pacing, IIRC. Xifeng being the Evil Queen, I remember there were times when I kept having to ask myself when she’d actually get to E.Q. level of actions because it didn’t really seem like she did for a looong time. Great reviews! 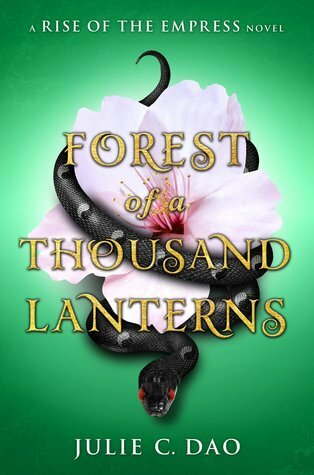 I’ve been seeking out more Asian-inspired fantasy and I remember considering picking Forest of a Thousand Lanterns up when it first started making the rounds on the blogosphere, but something kept putting me off reading it. I’m not actually the biggest fan of villain origin stories because I think they’re rarely done well, especially if the villain in question is a woman. I hated Disney’s Maleficent film, for example, because it took a compelling villain from the original who literally described herself as ‘the mistress of all evil’ and turned her into a woman who threw a tantrum because a man broke her heart. I’m so bored of lady villains having origin stories centred around men. Great reviews, CW ❤️ I always give the sequels a chance especially if they are companion novels. I would love to read more anti heroine stories because I haven’t found many books with that concept yet. Great review! It’s so interesting that I felt exactly the same way! I just wasn’t invested in Xifeng as a character, but I was rooting for Jade the entire time. This is really interesting. To be totally honest, I would not pick up a sequel if I didn’t like the first book. It’s just so rare – in my experience – that the second book will be better (let’s face it it’s usually worse) that most of the time I can’t summon up the enthusiasm to continue. You have challenged my worldview though! Maybe I should start giving my authors more of an opportunity to develop. Does it count as an anti-heroine if they aren’t 100% evil? Cause if so my answer would have to be To Kill a Kingdom. That’s totally fair! In most cases, I wouldn’t pick up a sequel if I didn’t like the first book either, but when I read that it reads as a standalone… 👀 I was so curious. Yes, definitely! And in the case of FOTL vs KotBP, the latter is a SIGNIFICANT improvement. It was really lovely. Honestly I probably skipped the first one as I feel villain stories rely too much on you liking the idea versus fleshing them out. But I might check out the second one as I like quests and niceness in the face of bad things. Definitely go for it! If you like those things, then you’ll probably enjoy the second one. I hope you like it! Yes, you definitely can! I agree with reading FOTL first because it makes a LOT of references across, and enhanced my reading experience of KotBP! 💛 I hope you enjoy FOTL more than I did – it wasn’t just for me, but I hope it will be for you! Thank you for your honest review (and why didn’t you tell me you didn’t like it sooner?!!?!). I am really glad that you gave the series a second chance and that the second book worked for you, that’s so interesting. I like that each can be read as a standalone, though! I know oodles of people who loved it and tbh, I’m an outlier! And for me, it was just one of those, it’s not you, it’s me sort of books! Right? It doesn’t happen often, and I’m more inclined to feel silly for continuing with a story but, I’m glad it worked out in the end for me!